I'M NOT CRYING, I just have the glory of this video of Hillary Clinton casting her vote stuck in my eye! Tuesday morning, the Democratic presidential nominee hit up her local polling station at Douglas Grafflin Elementary School in her hometown of Chappaqua, New York, alongside husband Bill Clinton. Hillary Clinton entered the polling station amidst cheers, walking through the polling station and greeting fellow voters as well as taking media questions. "It is the most humbling feeling, because, you know, I know how much responsibility goes with it — and so many people are counting on the outcome of this election, what it means for our country, and I'll do the very best I can if I am fortunate enough to win today," Clinton told Voice of America on her way into the polling station. 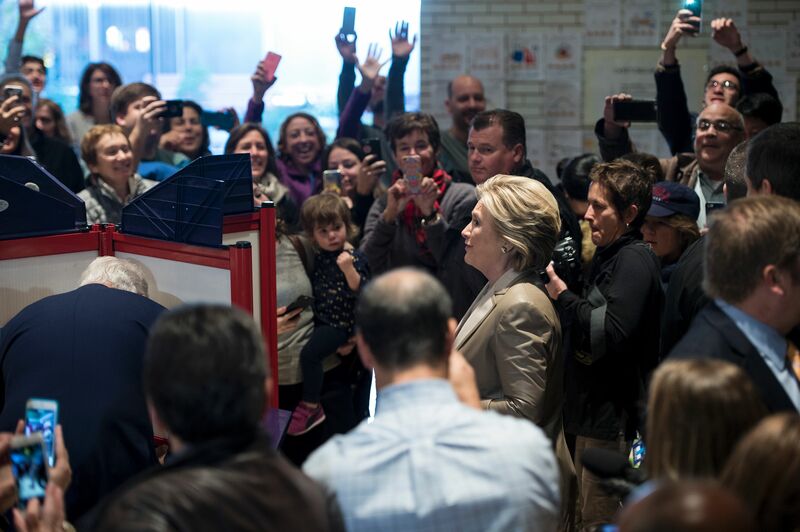 The magnitude of the moment was not lost on Clinton or the surrounding voters, who continued to cheer throughout her walk through the polling station and let out a great whoop when she finished casting her ballot. The nominee only returned to New York in the early hours of Tuesday morning after finishing up the campaign with a concert in Philadelphia Monday night and hitting up a midnight rally in North Carolina. With the campaign in its final stretch, Clinton appeared more than ready to take on whatever this Election Day will bring. Clinton's running mate Tim Kaine voted in the early hours of this morning in Richmond, Virginia, reports CNN. Despite arriving at the polls at 5:54 a.m., he discovered that there was already a woman in line ready to cast her ballot — at which point, true to form, he proceeded to tweet the most Dad joke of all time. Here's to hoping he gets at least four more!